What should I do before delivery? Make sure that your shed site is clean and level. 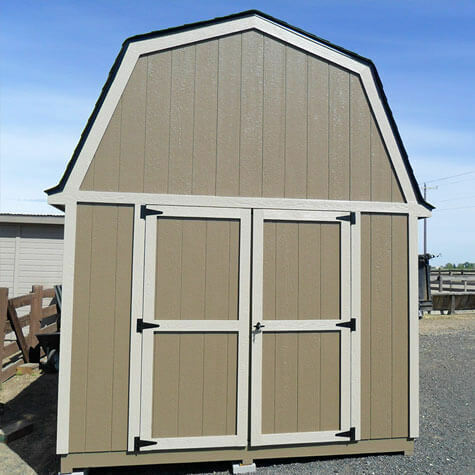 Additionally, it is a good idea to check your local zoning and HOA requirements to ensure that your shed placement meets any minimum setbacks. Possibly. Most sheds with a square footage of less than 200 sq. feet do not need a permit. One needs to verify this with any possible local city/county agencies and HOA’s. How long will it take to complete the shed? Installation for a basic shed usually takes 4-8 hours. Larger sheds and/or sheds requiring permits may take longer. We require a 50% down payment upon acceptance of bid, with balance due upon completion. Your deposit enables us to reserve an installation date, purchase building materials and pre-cut the lumber for your shed. We accept cash or check and credit cards accepted with an additional 3% fee. What are my accessory options? There are many accessory options to choose from to meet your specific needs. Please see some available options by visiting our 'Options' page or come by our shed display at 10801 Franklin Road, Boise ID.